A new, original Christmas spiritual by Jay Althouse in the traditionof his top-selling Whisper!, Whisper!, I saw a Star, and Star of Glory. This full-sounding work features much three-part singing over a solid, traditional bass part, as well as an echo section between the women and the men. Sudden dynamic changes are powerful and effective (and simple to sing). A new, original Christmas spiritual by Jay Althouse in the tradition of his top-selling "Whisper!, Whisper!," "I saw a Star," and "Star of Glory." "Come, See The Baby" features much three-part singing over a solid, traditional bass part, as well as an echo section between the women and the men. Sudden dynamic changes are powerful and effective (and simple to sing). "Have You Heard The News" is everything you have come to love and expect from a Jay Althouse Christmas spiritual, and a whole lot more. Lively and quick lyrics, solid rhythmic hooks, and refreshing parallel chords fill every phrase, followed by melodic riffs from the men's section. A contrasting middle section gently holds back before the A section returns including a well-written modulation and rousing descant over the final flourish. A great addition to your choral library. If you're having trouble finding a good, singable spiritual, look no further! Patsy Simms' arrangement of the traditional "Good News" is your choice. Features a rollicking piano accompaniment, some handclapping and a swinging descant on the final chorus. "Festival Deck The Hall" is a fresh and contemporary a cappella approach to a traditional carol. 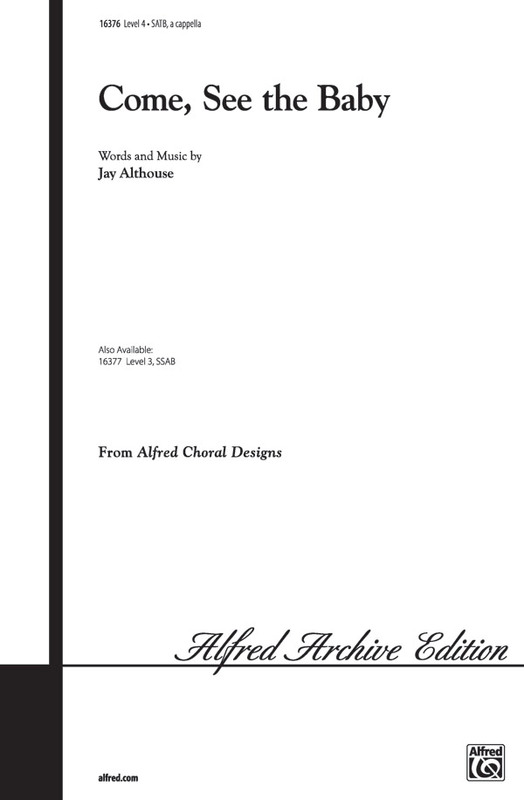 Jay Althouse has added wonderful new rhythms and harmonies, and has added a completely unique "fa la la" section reminiscent of a Swingle Singers arrangement. The first part of each phrase is true to the original carol; it's the "fa la la's" which take off in a whirlwind of choral excitement. Original, exceptional...and your singers will love it! Also included in thiis package is "Look-A That Star," "Who's That Baby," and "The Twenty-Fifth Day Of December."